Believe it or not, I'm not actually a shy person. Put me in front of a group of people for a planned session such as training and I have no problem talking (I spent a few years as a TAFE teacher after all). Drop me in an ad-hoc, unstructured conversation however and sometimes I get so nervous that I lose my words. I often blame this on my poor hearing and it's certainly a large part of the problem. It's not that I can't hear though, it's anxiety. I get anxious for a variety of reasons but recently I've managed to overcome at least some of it. While I'd love to be able to say it was my hard work, it really wasn't. It was a clever choice on the part of one of my work colleagues. I've read very widely on the subjects of Asperger's syndrome and high functioning autism - and of course, I've interacted with a great many people on the spectrum over the years. Everyone is different and no amount of rules and exceptions can take into account the extraordinary beauty that is simply "individuality". Nevertheless, there's a constant thread that runs through nearly all of the cases I've heard; anxiety. 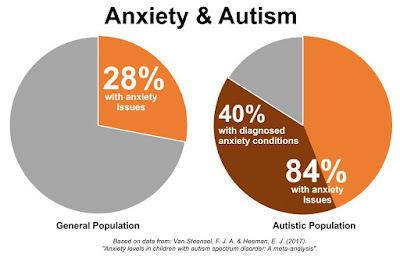 Anxiety is the driving force behind many of the common factors of autism including; the fear of change, of eye contact, of loud noises and problematic textures. The issues of perfection and patterns tie into anxiety as well as many well known social issues, even stimming. I think that everyone takes a little while to "warm up to others" and this is particularly true when it comes to the workplace. Some people have really friendly faces and voices and are very approachable while others are not so easy to get to know. I think that people on the spectrum often come across as less approachable when in fact they are happy to interact. It's all to do with not having body language and tone that sends the right signals. Not to mention poor social skills and high levels of anxiety. I've found that after repeated engagements, people at work sometimes begin to understand this and can end up being good friends. Not everyone is like this however. Some people never understand and many do not have the time or inclination to try. There's another class of person that causes me great anxiety. It's people who I look up to and people who I respect. I first realized that this was a problem when I was meeting actors from Doctor Who (a TV show that I have a 46 year obsession with). I was at a book signing in Sydney and the actor Colin Baker was there. It was in relaxed and familiar surroundings and I was eager to meet him. Strangely enough though, the closer I got to the front of the line, the more I wanted to run. In the end I got my book signed, mumbled a barely audible thanks and got the hell out of there. 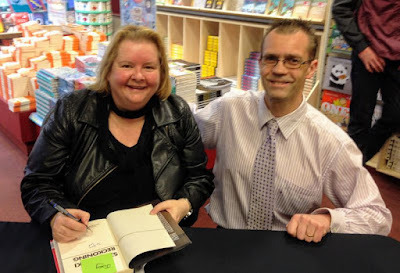 The same thing happened when I met Magda Szubanski, an actress for whom I have a great deal of respect. In her case I managed to tell her that I'd watched her since the original "D'Generation" series back in 1986. We got a photo and she tried to talk to me but I was so nervous that finished up quickly and made a beeline for the door. I remember her acting a little surprised at the behaviour. I struggle with stars, personalities and high-level bosses, which makes work very difficult at times because bosses need me to fix their computers and when I'm in their offices, my words are failing, I'm not thinking straight and all I want to do is get out of there. We have regular functions at work and these increase dramatically as we head towards the end of the year. These are always quite difficult for me but I've learned one trick over the years. I relax considerably if I have a few glasses of wine. As a result, I often start these functions with an awkward silence in which I "down couple of drinks" as early as possible. It makes as massive difference and of course, successive drinks make socialisation even easier. I don't really want to be a drinker but if it makes it more bearable to interact with people, it's worth it. I've heard from a lot of people in the autism community that things like cannabis work wonders for relaxation. Personally I'd never consider that option but I can understand why some people do. Over the years, I've learned that it takes quite a few drinks for me to feel like I can interact successfully with upper management and that by the time I'm in a state where I can function, others are not -- or they're ready to leave. For me, this means that it's only the longer functions, such as the office Christmas party where I can truly interact with these groups as if I were a "normal" member of staff. Getting back to the point of this post, I wanted to talk about how a change in conditions has led to a longer term breakthrough for me. I've always been a much stronger writer than a talker and I feel that it's important to respond to management's requests for information and opinions, so when we were asked to provide feedback on an issue, I did so. This resulted in my being asked to discuss it further over coffee. I stressed over the upcoming meeting for weeks but oddly enough, once the meeting was in progress, I felt myself relaxing. I'm not sure if it was the fact that I only had to deal with one person at a time or that we were in unfamiliar surroundings or that there wasn't giant desk marking the clear lines of authority between us. All I know is that I was able to relax and be myself in that situation without needing alcohol to do it. More importantly, I've discovered that further interactions with that particular manager are working. I'm still not entirely relaxed but I'm not constantly fighting the urge to run out of the office and that's a big plus. I guess the main thing to learn from this is that while it's possible to use "social lubricants" in order to function during "social events", they don't fix problems but only mask them -- and of course, if you go to a lot of social events, it could become an easy path to addiction. The only way to truly function in social events is to be with people who you can relax around. If there are people who you want or need to be around and you can't relax, then you need to find a way to break the ice. For managers; if you're in a position where you're responsible for staff, it's important to get out of familiar surroundings and talk to them one-on-one. If you have one or more staff members who don't interact well in meetings, don't assume that they have nothing to say -- it could simply mean that meetings are not the best means of communication for them. You need to work on alternative styles of communication. For general staff; If you're a staff member reporting to a manager, you have to push yourself to not only attend meetings but also to interact during them. If talking is too hard, try writing. You need to ensure that your voice is heard -- even if it's only via office emails and social posts. If you fall silent, you become simply "wallpaper" for the office. You lose both job satisfaction and relevance. When I'm at work and have to be around people who have some sort of authority over me... for example when I was a teacher it was the principal, special ed director, and school psychologist... I'd get so anxious, it was very hard for me not to be mute! This especially sucked because they were often there observing my performance, and I did a lot better work with kids and parents if these people weren't sitting there watching me.